As well as our regular and guest tutors Falkirk Fiddle Workshop has played host to some of the most talented performers and teachers of the present time. These have included Sarah Jane Summers, Chris Stout, Pete Clark, Gregor Borland, Marie Fielding and Marianne Campbell. From time to time the workshop organises concerts featuring either our guest tutors or visiting musicians. To date we have been treated to excellent performances from Catherine Fraser and Duncan Smith, Gavin Marwick and the Journeyman Project, Douglas Lawrence and Maureen Rutherford and Nellie Quinn and Seth Tinsley. On 18th May 2013 Falkirk Fiddle Workshop plan to host a workshop featuring local fiddler, multi instrumental and singer songwriter Brain McNeill. This event is being run in conjunction with Falkirk Folk Club and details will appear on our "Events" page nearer the time. 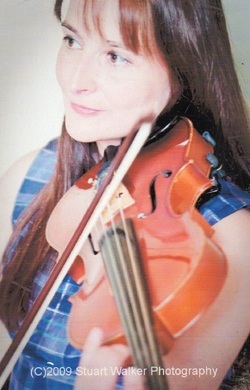 Lorna has been a tutor at Falkirk Fiddle Workshop since its early days. She teaches at the Falkirk Traditional Music Project run by Falkirk Community Trust. In the past she has worked with Falkirk Council Training Strings Orchestra. Lorna has played in Ireland, France, Germany, Poland and USA and in many of Scotland’s castles and best hotels. As well as solo work Lorna currently plays with the “Reel Ale” folk group & ceilidh band. A tune written by Lorna has been added to the web site. Sandy has been playing fiddle since the age of sixteen. Although he has had little formal tuition has benefited over the years from attending a number of summer schools and college courses. Tutors have included Tom Anderson, Aly Bain, Angus Grant, Bill and Alastair Hardie, Angie McEachern and Douglas Lawrence. 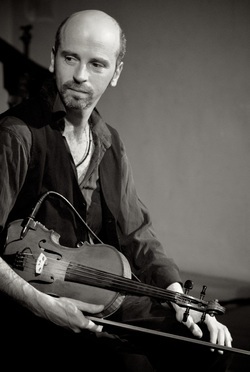 On the performance side Sandy has performed with numerous ceilidh bands, most significantly "An Teallach" from 1987 until 1990 and since 2002 with the locally based "Skelpit Lug". In addition he has played many festivals and sessions both Scotland and beyond, Cyprus and Russia being the most distant shores he has visited. Douglas Lawrence hails from Buckie in Banffshire where he was born in 1957. He started playing violin at the age of nine when given a violin by his maternal grandfather, Duncan MacLeod. Duncan was a forester from the Black Isle, famed within the locality as a composer, raconteur and violin repairer. He gave Douglas much encouragement, even after his death remaining an influence as his favourite violin (pictured right) a 1906 George Dyker of Forres remains in the family. 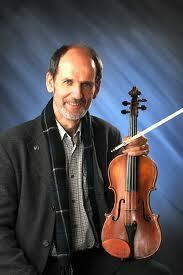 At school Douglas was given violin tuition from Steven Merson. It was he who introduced Douglas, at the age of twelve, to Hector MacAndrew, -one of the greatest exponents of Scottish fiddle playing. He went on to become MacAndrew's most distinguished pupil, winning every major fiddle competition, including the International Gathering of the Clans at the Usher Hall, Edinburgh in 1977 and the Golden Fiddle in 1979. Douglas has also written a few tunes, his compositions winning at the Elgin, Banchory and Kirriemuir festivals, with two of his latest on his current recording being, "The Findhorn Clerk of Works" and "Lorna's Delight", both receiving critical acclaim However, he kept regular contact with Hector MacAndrew up until his death in 1980. In tribute to Hector MacAndrew, Douglas performed with Yehudi Menuhin at a concert in Inverness on 21st April 1980 - an event talked of to this day. Douglas studied for four years at the Royal Scottish Academy of Music and Drama, where he obtained a performers diploma, and also first met Alastair Moore., a fellow student. On graduating, he spent twenty years performing, touring and recording with the Scottish National Orchestra. Over the years Douglas and Alastair performed together widely throughout Scotland and have remained good friends ever since. Douglas is delighted that Alastair has contributed his musicianship on the latest CD. Douglas has broadcast regularly on both local and national television and radio. Not only highly regarded as a performer, he is much in demand as both an adjudicator and teacher. Douglas has toured extensively throughout Europe, the Far East, as well as the United States of America and New Zealand where he has performed and given workshops to great acclaim. Closer to home he teaches at the Glasgow Fiddle Workshop, Falkirk Fiddle Workshop and is on the teaching staff list of The Royal Conservatoire of Scotland. Gavin was born in Edinburgh and brought up in a family that was full of traditional music. He was taught traditional fiddle by Alistair Hardie, Davy Tulloch, Angus Grant and Tom Anderson, and classical by Michael Rigg. As a performer he has played at hundreds of festivals, concerts, theatres and dances across the UK, Europe, North America, Asia, Australia and Africa. Bands he plays/ has played/ recorded with include JOURNEYMAN (focusing on his original material); Iron Horse; Cantrip; Burach; a successful fiddle duo with Jonny Hardie which released the albums Up in the Air and The Blue Lamp. As a session musician he has performed/ recorded with The Unusual Suspects, Session A9, Wolfstone, Arz Nevez (BRZ), Malinky, Leo McCann, Old Blind Dogs, Annie Grace Band, Jimi Shandrix Experience, Stevie Lawrence, RSNO, and Sogdiana (UZB) amongst others. He is a prolific and enthusiastic composer of tunes and has been greatly inspired by musicians and cultures he has met on his travels. As well as recording some of these tunes with his own projects, some of them have been recorded by other musicians like Marie Fielding, Old Blind Dogs, Dochas, Liz Docherty and Give Way. He has written for TV, radio and theatre: with the Traverse in Edinburgh his work includes the music for Outlying Islands, Heritage and Faith Healer. He has also worked with NTS in Gobbo and the Watchmaker, with Licketyspit in their production of MOLLY WHUPPIE and with Dogstar in THE TAILOR OF INVERNESS. Fiddle Finalist in Young Traditional Musician of the year 2014. Having grown up immersed in the culture of Scottish Traditional Music, Mhairi was hugely inspired to play the fiddle. Her first teacher was James Alexander MBE who was, and still is, a great influence and inspiration. Playing with the Fochabers Fiddlers directed by James widened and developed her traditional style. Mhairi has just received a First Class Honours in BA Applied Music at Strathclyde University and was taught by Alistair McCulloch throughout her degree.